"You've run out of options," Victor explains to Adam. 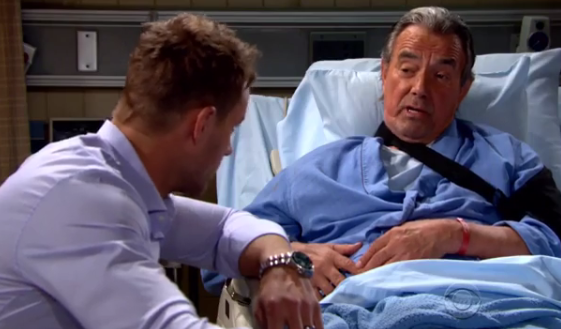 Check out the day-to-day spoilers and a sneak peek video below to find out what's happening on CBS soap opera The Young and the Restless during the week of July 11-15, 2016. Jill returns to Genoa City; Chelsea and Kevin pursue a lead about Victor's associate; Phyllis feels pulled between Jack and Billy; Nikki asks Michael for help. Billy clashes with Cane; Devon makes a peace offering to Hilary; Victoria asserts her authority over Summer and Luca. Jack and Phyllis must make a decision about their marriage; Victoria contemplates an offer from Travis; Adam surrenders. Victor's accomplice turns up; Michael advises Adam; Sharon fights to keep her secret. Jack makes a big decision; Hilary gets a wake-up call; Stitch talks to Abby about their relationship.